YOUR 1-4 YEAR-OLDS WILL LOVE THESE BRIGHTLY ILLUSTRATED BIBLE BOARD BOOKS.EACH BOOK TELLS A FAVOURITE BIBLE STORY IN SIMPLE WORDS THAT WILL REINFORCE GODS LOVE FOR THEM. FROM CANDLE BOOKS. 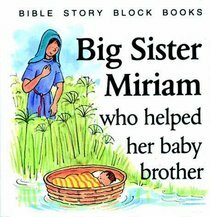 About "Big Sister Miriam Who Helped Her Baby Brother (Bible Story Block Book Series)"
Part of the Children of the Bible block books series.